It’s really unfortunate that a man of his stature and position, with the training that he has in medicine, chooses to spread quackery and nonsense on his show, without offering genuine opportunities for professional organizations that dispute his alleged science (and I use the word alleged quite deliberately). I guess when it’s all about ratings, and when you have Oprah as a backer, you can do what you want, but that makes it no less irresponsible. Are Silver Fillings Really Toxic? The hocus-pocus, try-to-scare-you, not-backed-up-by-any-reputable-science answer is that yes, silver fillings are “toxic.” The problem is this: none of the methods used to demonstrate this alleged toxicity are any good. Sure, they try to show you some videos that supposedly illustrate “mercury vapor” rising from a tooth being rubbed by an eraser, or they’ll tell you about some gadget that measures mercury levels after chewing, or they’ll tell you about studies with sheeps’ teeth, but they problem is……they’re all bunk. If anyone truly wants the scientific studies that refute that junk science, let me know and I’ll send it to you. The real answer that is supported by all reputable science……., NO, THEY ARE PERFECTLY SAFE. Are Dentists Trying to Poison You with “Mercury” Fillings? 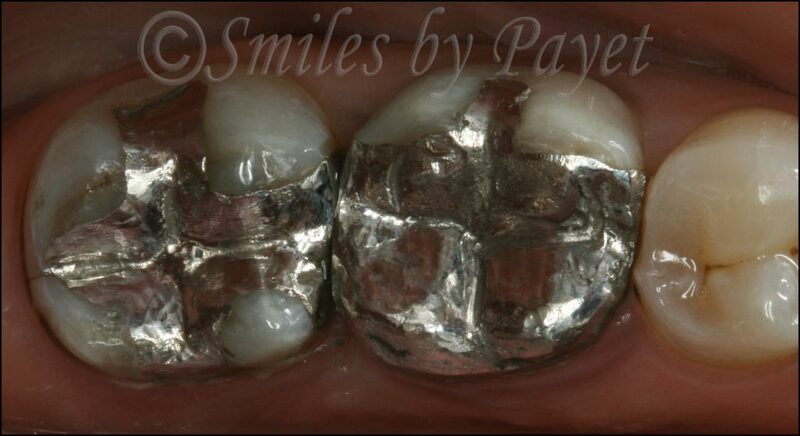 So here are 2 humongous silver fillings that I just did a few weeks ago. Then read on for my questions for anyone who actually believes in this ridiculous, total BS, POS, stupid, moronic conspiracy. If these fillings are so toxic, why would I put them in someone’s mouth? Am I evil and diabolical? ‘Cause really, either you’re assuming I’m evil and diabolical, or you’re assuming I’m stupid. Or maybe all 3? There are 150,000 general dentists in the USA, and at least 2/3 of them (about 100,000 of us) still use amalgam fillings. Are we all supposedly part of some massive conspiracy? Are we ALL dumb, evil, and/or diabolical? An estimated 100 BILLION amalgam fillings have been done around the world, yet somehow good scientists can’t find any good connection between these fillings and ANY real disease? I mean, c’mon – with that many in place, you’d think SOME good science would be able to find a connection, but nope, not yet! If my 6yo daughter had any cavities on back teeth, you know what I’d use? SILVER FILLINGS! Why? Because it’s much harder to bond tooth-colored fillings to the enamel in baby teeth, and silver fillings stay in better. Do you REALLY think that – even if I’m part of some alleged international conspiracy to cover up the poisonous effects of these things – I would put them in my own daughter’s mouth? REALLY? ‘Cause if you do, then quite frankly, nothing I say will ever convince you otherwise. Given that I could have made $1-200 more by doing tooth-colored fillings, or about $2000 more if I’d done crowns, I CLEARLY didn’t do these huge silver fillings because of money. So really, if you think there is a massive dentist conspiracy to poison people by using “mercury” fillings, then you must believe that we are (1) evil, or (2) stupid, or (3) both. Regardless, you don’t want to come to my office. I am 100% confident that the science proves they are perfectly safe, and I place them on a regular basis. The simple fact is – those huge fillings above will probably last the lady for 20+ years, and combined they cost less than 1/2 of a crown. They don’t look pretty, but she can chew with confidence, and it didn’t put nearly as much strain on her budget, and flat out they WORK. Alright…….flame retardant suit on……lemme have it! But only a respectful debate will be allowed in the comments, and no junk science links will be allowed. Hey – it’s my website, right? Please feel free to give us a +1 on Google+, Share or Like us on Facebook, whatever floats your boat!